Environment Canada Weather Office | How does Your Weather Look? Looking for the Environment Canada weather office webpage? They changed the web address for these commonly used pages, and the old weatheroffice.com domain has been replaced by weather.gc.ca. This is the present location for the weather office Canada website. It is still maintained by the Canadian federal government, under the department of Environment Canada. 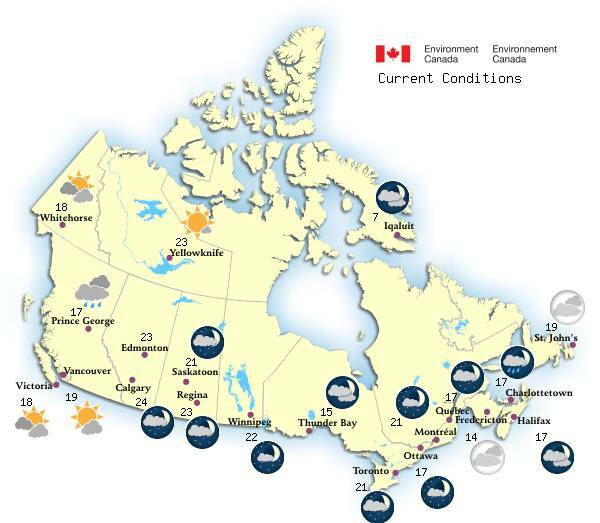 The page in the previous link presents a national map (as described in this link) with current sky conditions and current temperatures for the major cities in Canada. The table below the map shows current conditions all of those centres at once, with links to forecasts for each place. Select any weather station Canada has to get its seven-day forecast, detailing daily high and overnight low temperatures as well as expected precipitation. small towns and Marine areas. If you want weather predictions for any of the smaller places, click a neutral area within your desired province on the national map. It takes you to a provincial map with some of the larger cities and towns shown on it and a more complete list of populated areas and military weather stations provided in a framed area within the page. Just pick one and see the forecast. If you want to jump to another province, the list of two-letter codes above the town-names enables you to do that quickly. You can also get marine forecasts for specified coastal areas. Do this by picking the "Marine - Canada" link and then your water region on the national map that appears, where marine-blue patches now replace the drawing of a sailboat used on the previous version of this map. The list of "weather links" as well as "weather forecasts" below the major cities listed on the main page gives you the opportunity to see other features. Things such as satellite and radar images for instance. It also gives you public alerts, seasonal forecasts, air quality and long range forecasts. If you're interested in Canadian climate, these items from the weather web pages are certainly worth exploring. designing one to attract readers. Search this site for more information now, go back from Environment Canada Weather Office to the Weather Canada web page or visit the Stuff in the Air homepage.